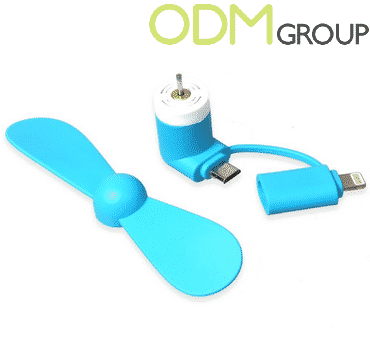 The heat is rising as summer fast approaches and all kinds of promotional marketing gifts such as fans, are one of the first products to be used. 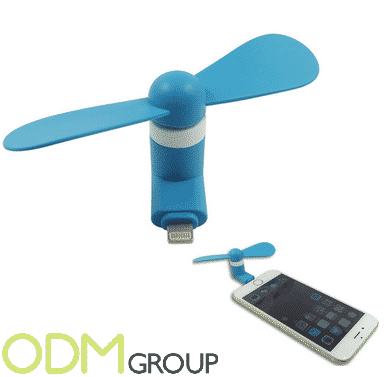 Mobile fans are brilliant summer marketing gifts ideas because they are used very often, and that is why mobile powered fans that can be plugged into your devices make very practical items to promote especially as free purchase gifts. The reason these are interesting summer marketing gifts is because they create a hands free solution to keeping cool when on the go. In a world now run by technology, people everywhere use their phones and often find it fiddly to hold other objects when using, so these items would be perfect when walking, on public transport or at home. The fans themselves work by being plugged into your phone or tablets charging port and run off your phones battery power, easy! Adding to convenience, they can also be used with both newer Android and iPhone models and being tiny in size means these mobile products are portable and handy. Also made from a high quality plastic, they are more durable and comes with a good motor to make the breeze you feel more comforting. How can these summer marketing gifts help in promoting your brand? Design. 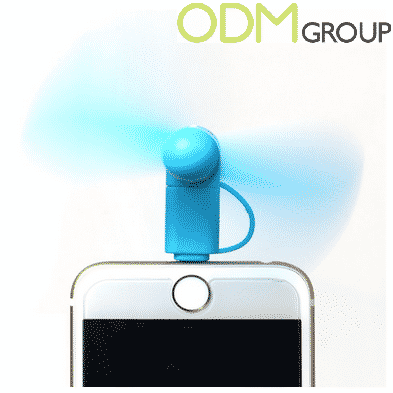 After seeing many kinds of promotional gadgets for mobiles, this kind of item is rarer, therefore if people see you using this fan, they will find it more interesting and will have a better brand recall for your brand. Free advertisement. These marketing gifts fans are an easy way to promote your brand for free because they will be used in public, outdoors and indoors. Your logo can also be printed on the fans further emphasising the impact your brand will have. These make nice marketing gifts ideas to be given away during summer events, festivals as well as free gifts with purchases on summer related promo products and for electronics brands to promote. If interested in this product, feel free to contact us at the ODM Group for more inspirational ideas, and for this specific product quote ref number ODM-1189. You might also like these summer beach promos. We love sun screen and its the type of summer marketing gift that is really appreciated. Check out our summer beach mats for the beach. Marketing gifts never so cool. Check out some more cool summer marketing gifts.